The Whistler Inspection Camera makes it easier to locate mechanical problems deep inside a vehicle's engine to find part numbers and more. Tight spots and hard-to-reach areas are more convenient to get to and to see clearly thanks to a thin and flexible camera tube. LED lighting reveals more details while a color LCD monitor shows accurate and crisp images. A wide-angle viewing lens see everything you need to see. 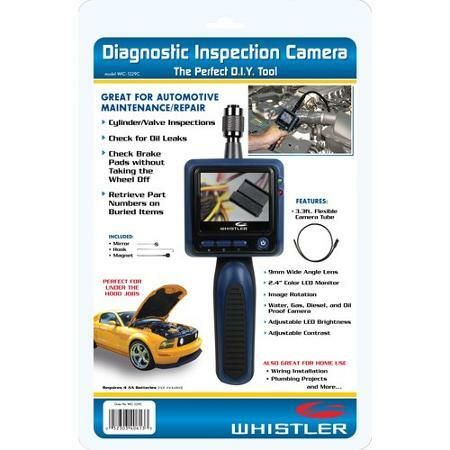 This automotive inspection camera is handy for home auto repairs and it is also suitable for use by professional mechanics. Other accessories are included such as a hook and a magnet for retrieving loose parts and a mirror for looking underneath components.